Here are parts 2, 3, and 4 of the guide. Here’s some background info, some notes before you begin playing, and my review of the game. So our hero/heroine wakes up in the house of Sahasrahla’s brother Agihna. Agihna says that he found you lying on the ground nearby and he took you in. While he does not know who you are, Princess Zelda claims you are the only one who can save Hyrule. (Relying on the last descendant of the Hyrulian knights after he has saved Princess Zelda is one thing, but isn’t relying on a random child who just dropped from the sky a little too much?) Agihna marks the location of the first dungeon on the map, and asks you to proceed there. During this conversation, he’ll also give you a huge bag. This bag allows you to hold your items as Link did in a Link to the Past. You’ll notice that you are given a bug-catching net, an ocarina (the flute from a Link to the Past), a lamp, and a bottle. The bottle contains a golden bee which can help you attack enemies. The lamp uses a small amount of magic in order to light torches in dungeons. When the ocarina is played, a bird is summoned that can take you to various locations on the map. Finally, the bug-catching net can be used to catch fairies as well as recapturing the golden bee. These weapons can be used with the Y button. Now go outside of the building and head towards the marked location on your map. You can pull up the map with the X button. You’ll realize you have no sword to combat the enemies. You can either just run around the enemies, or release your golden bee, which will follow you and kill any enemies close to you. On your way to the East Palace, there is a cave. This cave contains fairies that can be caught using the bug-catching net. Fairies can revive the hero once with several hearts. There are many caves with fairies scattered throughout this game. Since you have only one bottle, decide whether you want to keep the bee or get a fairy. Be careful with the golden bee, as it’s possible to lose it if you keep it out too long, run too fast, etc. Now enter the first dungeon of the game, the East Palace. Keep in mind these dungeons aren’t actually named and that I’m actually making the names myself. You’ll notice that you still don’t have a sword. Technically you do not need to kill any enemies before the room where you obtain the sword. However, if you wish to kill any enemies, you can either throw pots at them, or you can release your golden bee. First, proceed to the left room of the palace. The door will immediately shut behind you. A switch to open the door is present underneath the pot at the bottom-right hand corner of the room. A key is under the top-left pot in the room. Pick up the key, step on the switch, and proceed back to the first room of the dungeon. Now go through the right door. Unlock the door at the top using your newly found key. In the next room, open the chest to receive the level 1 sword. The panel on the wall says you can bomb the wall to the left. However, at this point, you probably don’t have any bombs. So hit the red switch in the room to lower some blocks (press B to swing your sword), and then proceed right. In this next room you’ll get 10 bombs from a chest in addition to a key underneath a pot. Proceed to the right and open the chest to get the dungeon map. Now it’s time to teach you how to find the portion of a wall that can be bombed. This is done by hitting each part of the wall with your sword. The part that makes a different sound (like that of cutting bushes) should be bombed. Another approach is to look at the map screen. You will see indents in the side of a room based on where entrances and exits are present. Now that you have the dungeon map, you can easily see where rooms are present using the map screen. Sometimes there will be a crack in a wall. This also indicates that a wall can be blasted open with a bomb. Now, bomb the top wall and enter the room above for some rupees. 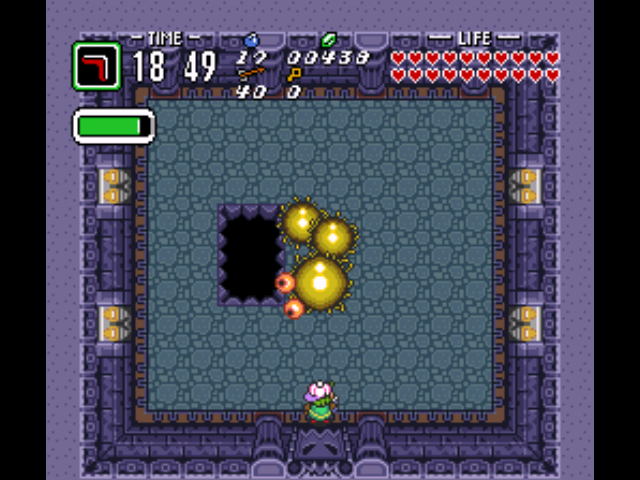 Go back to the room on your left and repeat this again in order to receive more rupees in another room. Keep looking at the map for secret rooms that can be reached by bombing a wall. 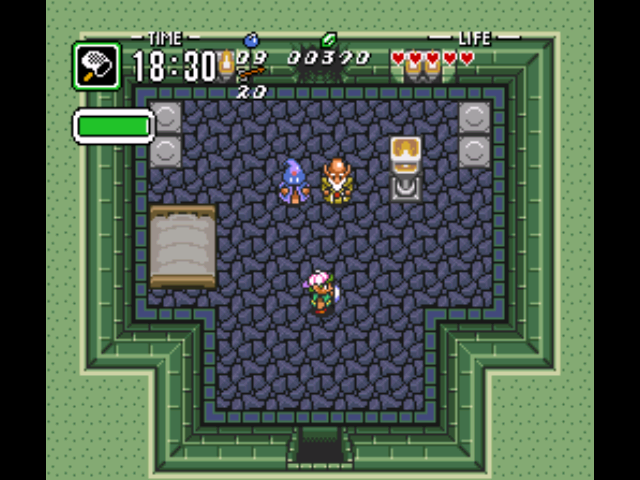 These rooms usually will contain extra prizes like rupees. There are a lot of these, so I won’t keep mentioning them. Now go to the left once more and bomb the hollow part of the wall. In this room on the left you’ll receive a small shield in the chest. The compass is in the room to its left. Go up a room to find a red skeleton. If you miss hitting this skeleton, it will jump away and throw a bone at you. Kill it either with your sword or a pot, and the room’s door will open. Proceed to the next room. Kill the enemies here if you like and go downstairs. You’ll see the big chest on the floor below, but we can’t reach it yet. Go to the right to the next room and fight six enemies. Once you’ve killed them the doors will open. In the next room, pick up a pot to find a key and go to the next room. Go up some stairs and pick up the pot in the corner. Step on the switch to reveal a chest that contains the Big Key. Open the Big Chest in this room to get a bow. Now go back up the steps and to the left. Pass through one more room and you will encounter a green motionless cyclops. You need to wake it up by going near it, and then shoot its eye with an arrow. A pot will also work on these green cyclops. Kill it to get a key and proceed. Kill the enemies in the next room the same way. Open the big key door to find a red variety of the cyclops. These require two shots to kill (pots can’t be used to kill these red enemies). In the next room, lift the pots to find a key. Open the chest to get the Pegasus boots. You can now turn while running with these boots, unlike in Link to the Past. To the right, a thief will allow you to hold 40 arrows if you pay her 50 rupees. Go back a room and go up to face the boss of this dungeon! If you’ve played a Link to the Past, this is exactly the same as the first boss in that game. Basically the 8 knights have two attack patterns. First, they can go around in a circle. You can avoid damage by just standing in a corner. The second attack pattern is to all line up at the bottom and hop towards the bottom of the room. Kill each of the knights by shooting them with an arrow 2 times (instead of LTTP’s 3). When you get down to the last knight, it will turn red and try to stomp you. Kill it with three arrows to finish the first dungeon. Now when I went outside, it was raining. Fish-like Zora enemies were walking around in the East Palace area. Go back to Agihna’s place. 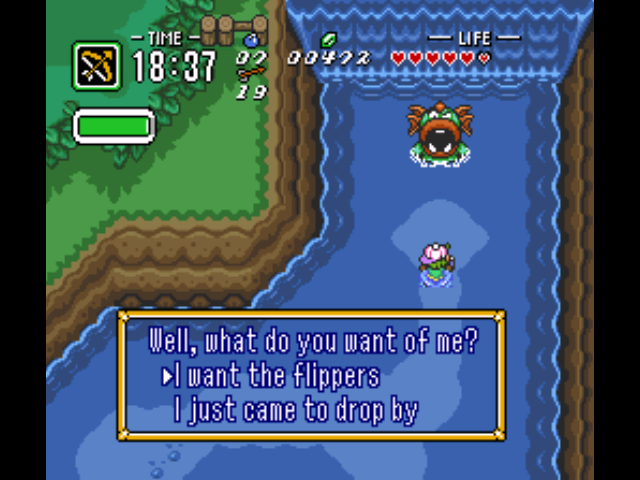 Agihna tells you to go up to Zora Falls to get the flippers. Bomb the top wall of his house to find a Piece of Heart inside. You probably saw a heart piece surrounded by holes in the bottom-right corner of this area. Use the Pegasus Boots to ram into the steps. You will then bounce back over the gaps and hit the heart piece. Then fall into a hole and get out of the cave. When you go back outside, I found the area to be foggy now. Go to the next area using the bottom-left exit of the current area. 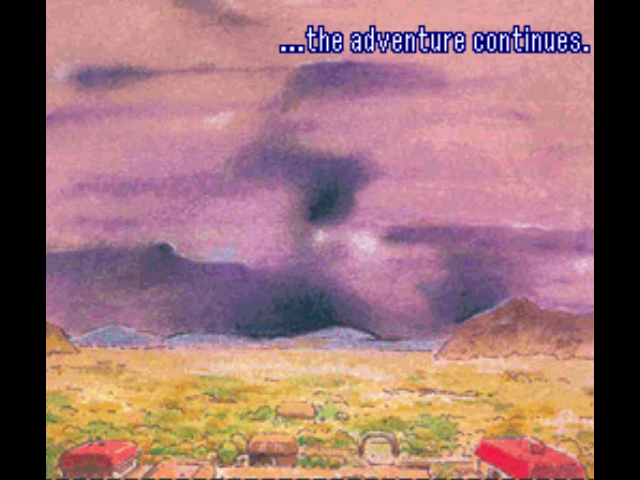 Go one map left and crack the oddly shaped rock by running into it with your Pegasus Boots. Inside there’s a heart piece. Also, when you go one screen up there’s a cracked wall. Bomb this to find a piece of heart inside. Keep going up to Zora Falls, which is in the direction where the second tablet is marked on your map. If there are any large rocks in the way, break them with your pegasus boots. On your way there will be a shop where you can rent a level 2 sword or a shovel. I skipped this shop since you’ll only be able to keep the items for a limited amount of time. However, for each episode, renting the shovel will allow you to get one Heart Piece. From what I understand the location will even be marked on your map. When you enter your first area of shallow water, you’ll see a 4th heart piece out in the open. Take that heart piece and break the nearby rock with your pegasus boots. Go down the steps to get some fairies if you’d like. Next, go to the top of the falls to get the Zora Flippers. You’ll need to pay 300 rupees to get the Zora flippers. With these flippers, you’ll be able to swim in deep water. All the money in those secret rooms in the dungeon will come in handy with this purchase. Now go back down a screen and enter the waterfall to enter the game’s 2nd dungeon. First push one block forwards and one to the side to get through the first set of blocks. Light the two torches at the top of the room, and proceed through the opened door on your right. Go two rooms right, kill the enemies there, and find a key underneath a pot. Return to the dungeon’s first room and now proceed through the left door using your newly found key. Pick up the dungeon map in the chest of the next room and kill the enemies here to proceed forward. Kill the enemies in this room. Go down 2 rooms to reach some stairs and a larger room. Go all the way to the bottom, pick up pots to find a a switch and then proceed through the door. Open the chest in this room to get the Big Key. Then pick up another pot to find a switch, open the door and go back left. 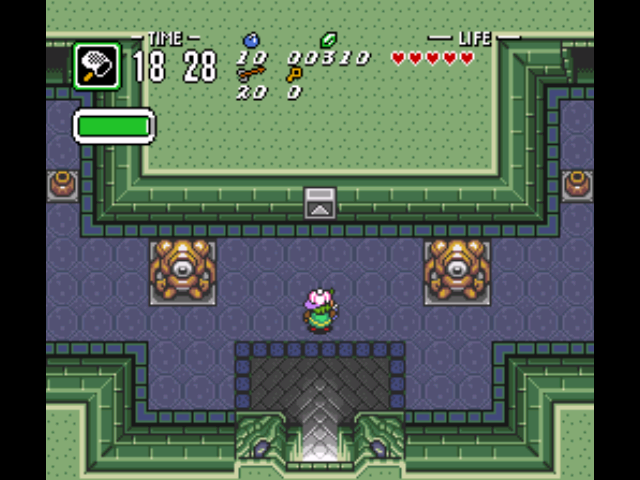 Now in the next room, go through the door on your left, and open the Big Chest to get the Boomerang (this is the Magical Boomerang of a Link to the Past). Now from the Big Chest room, go to the left to enter another room. 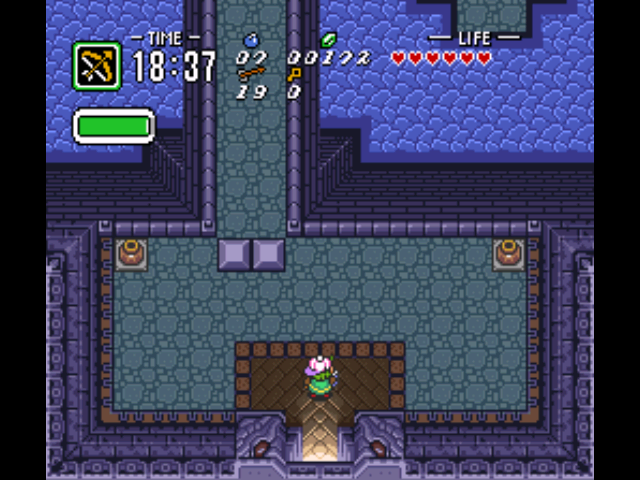 The bottom-left entrance leads you to a chest that contains 20 rupees. Go through the top door that requires the Big Key to reach the next room. Use the boomerang to collect the key on a ledge to your right. Open the locked door, go into the next room and then bomb the bottom wall. Inside a thief will give you a bomb upgrade for 50 rupees. Now go back a room and proceed upstairs. Upstairs the room will be dark and you’ll only be able to see a little bit in front of you. Go down into the next dark room. Go the left side and press the somewhat hidden switch, and then go right into the next room. This third dark room has two torches and a chest on the other side of a wall. Light the torches and just go up. Kill the enemies in the next room and you’ll receive a key. Go into the last room, open the door and be ready to face the boss of this dungeon. This is also another boss from a Link to the Past, except he’s much weaker. The strategy is to hit the boss’s tail and to not fall down the hole. You only have to hit him 3 times and the boss is defeated. Get ready for Part 2 of the adventure! If you happen to run into a mole at some point, talk to it and head towards where it says it’s buried some treasure. You’ll get about 500 rupees from a cave that he has dug. Once the hour is up, you’ll get a message from Zelda and Agihna thanking you for your help so far and asking you to head over to Sahasrahla’s house. You’ll start from Sahasrahla’s house in Kakariko village in the next episode. area to unravel my problem. May be that is you! Having a look ahead to look you. Nike and McIlroy from concluding or implementing their contract. three times at McDaniel’s nose. Nunca pegajoso, Miu Miu es una lnea hermana de catering para jvenes Prada. When” the ghost of Barack Obama” showed up at the first presidential debate, supporters and pundits alike acknowledged the failure. chic yet classic look with the Ursula large shoulder bag! potential to open approximately 40 stores in North America, Europe, and Asia. things to improve my website!I suppose its ok too use a few of your ideas!! therefore I simply use web for that purpose, and get the newest information. Choose the sort of poker room based on your level of skill and experience. – Stars tend to be or less the only place you ought to look, when you want to try out your preferred poker game.